Meal kit delivery services have become very popular nowadays. Apart from the convenience of dinner being shipped directly to your doorstep, they also give you the chance to eat healthy without spending much time and effort. Since most such services deliver cooking kits for you to prepare, you can also learn to cook or add some nice recipes to your collection. Menus vary, and you can always find a service offering just what you like for a quite affordable price. 10 Advantages of Home Cooking with a Meal Delivery Service. However, is it worth it? After all, you can always find a recipe online, print it out, get what you need from a supermarket and do everything by yourself. Getting half of the job done for you is nice, but isn’t it rather whim than necessity? In short – what are the real benefits you get if you opt for cooking with a meal delivery service? Let’s have a look. There’s one thing even the haters can’t deny, it’s that meal kit delivery services definitely save you some hours of your precious time, giving you more freedom to do what you really want, not just what you have to. So, you still have time and energy to watch that football match, read that awesome fan fiction story or play with your kids after dinner. Sometimes we buy more products than we need and fail to use them. As a result, food gets spoiled and goes into the dumpster. Meal kit services help avoid such situations by sending you only as much of each product as you need for the dish you’re making. It also works vice versa: you won’t have to worry whether you have enough of each ingredient since you’ll have it all in your box! Believe it or not, but in the long run, using a meal delivery service may even save your money. When in a supermarket you have to take big packs of products even if you only need one 3 oz. of milk or a pinch of baking soda. Hence, you may be actually spending more money to purchase the ingredients than your dinner actually costs. With meal kit delivery services, you only pay for the food you get, no more and no less. With most services, you don’t even pay a cent for delivery. Whether you’re a carnivore or a vegetarian, a paleo fan or a pescetarian, you will surely find plenty of options to choose from. 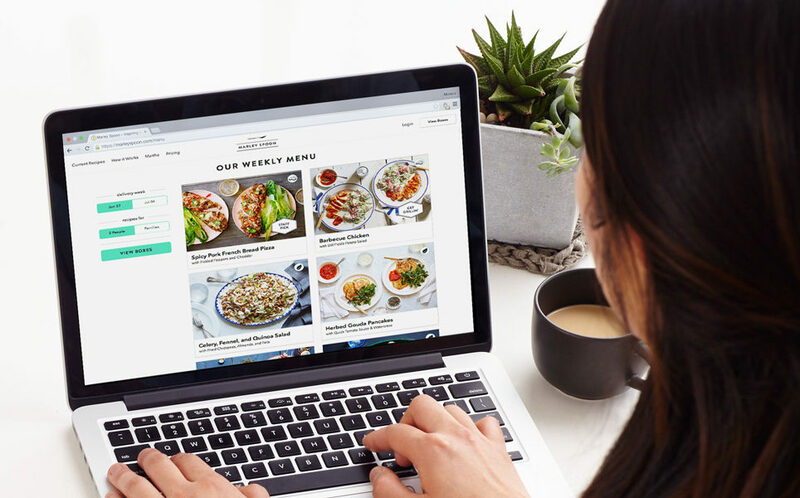 Since every subscription service wants to be the best meal delivery service ever, they try their best to create as many dishes and nutrition plans as possible. Besides, the dishes are pretty much unique since such services use a team of professional chefs to create their recipes. Some even have celebrity chefs in their teams (e.g., Martha Stewart and the “Martha & Marley Spoon” service). So, even if your family members eat differently, you will most probably find lots of different dishes for each of them! While meal kit services are designed to make your life easier, they still leave room for experiments and inspiration. Since you are the chef, you are free to alter the recipe and add your favorite flavors, a bit of lettuce or some drops of that spicy sauce… The recipes are usually simple and easy-to-cook, but hardly ever primitive. By the way, with some services, you can even choose the degree of difficulty of the dish you’re going to prepare! Say, you can spend 20 minutes to prepare dinner on working days but up to an hour on your free days. Although different services offer different menus, most of them focus on using organic ingredients and GMO-free animal products, making their meals not just tasty and nutritious but good for your health. Some services even have full gluten-free nutrition programs (e.g., Home Chef). However, if you’re allergic or have food restrictions, you should always consult your doctor prior to ordering. Following certain nutrition plans is not easy, and counting calories might be too tedious for many people. However, many meal kit services make it easier by indicating the estimated calorie count per dish on their websites or by even offering you special weight loss programs with healthy snacks, lunches and dinners. Feeding your children healthy food can be difficult. You don’t only have to select the best quality ingredients and cook, you also have to make them actually eat what you have prepared! And that could be a huge challenge (if you’re a parent, you know what we’re talking about). Meal delivery services such as HelloFresh help you with that by creating family boxes (usually for 2 adults and 2 kids each) and offering your kids something they hopefully will not be able to resist. Who knows – maybe they’ll even help you in the kitchen! You may think that using meal kit services is complicated, but in fact, it’s as easy as pie. You create an account, you get access to the menu you order. Some services also have mobile apps, which you can download and order from your smartphone wherever you are. Besides, most subscription services are rather flexible. Normally, you can skip certain weeks or even cancel your subscription whenever you want to. When you shop and cook all by yourself, it can often become a chore or even a burden. Meal delivery services give you the joy of turning raw ingredients into culinary masterpieces back to you without burning yourself out. And if you never cooked anything more complicated than scrambled eggs, the recipes from meal kits may help you reveal your hidden potential and surprise everyone around you. After all, what could be better than having family dinners and hearing compliments on your cooking? Now that you know the 10 Advantages of Home Cooking with a Meal Delivery Service, or at least the most important 10 benefits. Since i can name a few more, for now I’ll leave the rest up to you. Enjoy cooking! In your article, you stated in whether you’re a carnivore or a vegetarian, a paleo fan or a pescetarian, you will surely find plenty of options to choose from. My wife has been really frustrated because she doesn’t have a lot of time to prepare meals for the family and someone suggested having our meals delivered. I wonder what types of food most people like to have delivered. It sounds like my husband and I could use meal service deliveries. Because of our schedules, we don’t have a lot of time to cook. However, we had this goal about not eating out as much. It’s not going well, and I can also relate to that feeling bad after when food spoils and ends up in the dumper. AmazonFresh meal service – it’s coming. What is the best meal delivery service? What Are Chef Prepared Meals?